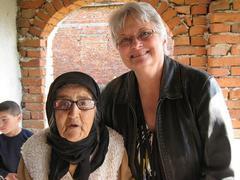 This 93 year old Romanian lady touched my heart when I was able to fit her in eyeglasses. It had been years since she had been able to read God's word, but this day she could finally read. I thought I was going to Romania to help people, but I was the one to receive the greater blessings. My mission is to edify and lift up the Name of Jesus Christ in everything I do or say! If Jesus be lifted up, the world will be a better place to live. He is the Way, the Truth and the Life. No man will go to the Father except through Him. It is my goal to reach as many people as possible and to show them the way of the cross. 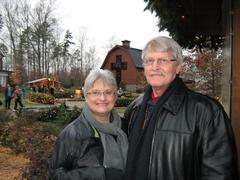 My husband/pastor, Roy and I are currently serving at Joyful Life Baptist Church in Kathleen, Georgia. We have never been happier. God has blessed us so much with this opportunity to work with some of the most dedicated Christians I have ever known. Our services begin at 10:45 on Sundays mornings. Sunday school starts at 9:30 a.m. I lead the Women of Truth Bible Study on Monday mornings at 10:00 a.m. What a great way to start a week! Join us and you will find the most welcoming congregation you have ever met. God is so good to me! If you are searching for a speaker for your next event please call me. I would love to get to knowing you prior to the event, so that we can be sure your event is just as you want it. I am open to allowing you to "have it your way," as long as it is God's way too. I speak on a variety of subjects and will match my talk to your theme. God called me to write in 1997. I have written ten books and thousands of newspaper and periodical articles. My stories have been in Guideposts, Chicken Soup for the Soul, Christian Reader, Happiness, Pathways to God, and many more. My book, Wake Up With Jesus, will be published in a few weeks. Keep watching for an update. If you want to compare yourself to someone else, make it Jesus.